Jennifer Lawrence and Chris Martin were rumored to have broken up last week. But, according to a new report – the couple is actually planning a wedding and trying to get pregnant with their first baby together. Talk about making a complete 180. Chris Martin was supposedly cheating on J-Law with Kylie Minogue, but it turns out the rumors were either totally false, and Jennifer Lawrence is a very forgiving girlfriend. Of course the guest list looks like that of an Oscars party, and includes big names like Angelina Jolie, Brad Pitt, Bono, and Bradley Cooper (along with whichever girlfriend half his age he decides to brig along). Chris and Jennifer are reportedly in a rush to say their “I Do’s” because the Hunger Games star has baby fever, and can’t wait to start trying to get pregnant. OK! Magazine reports that Chris is thrilled with the idea of being a father again, and can’t wait for his kids with previous wife Gwyn – Moses and Apple, to be a big brother and big sister. 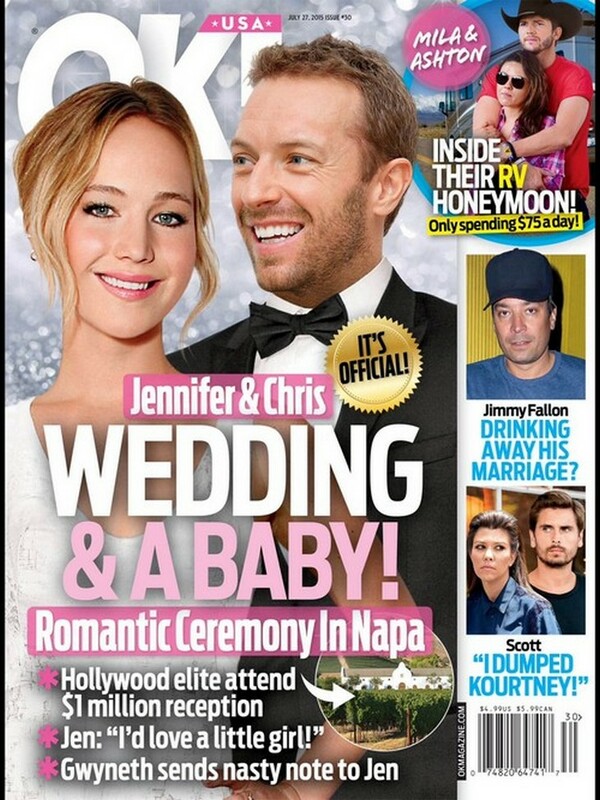 So, are you as shocked as we are by Chris and Jennifer’s wedding and baby plans? Do you think they will actually make it down the aisle or is there another break-up in their near future? Let us know in the comments below!